In the UK, six species of gull are present that are either common or abundant, these being the Black headed Gull, Common Gull, Great Black-backed Gull, Herring Gull, Kittiwake and the Lesser Black-backed Gull. Plentiful supply of waste from human activities (e.g. food litter) supplying an excellent food resource. Buildings provide safe nesting environments away from natural predators. Urban areas are warmer during winter months allowing occupation all year round, preventing the need to migrate. Besides causing general noise and annoyance, more and more reports describe the dangerous ‘dive-bombing’ behaviour of urban gulls during their breeding season. There has been at least one well-publicised death of an 80 year old man in Anglesey who was attacked by his garage, a woman from Burnham-On-Sea was hospitalised following a similar attack and a school in Sussex has had to rig netting over its playground to protect the children. Gulls damage roof insulation on buildings, their nests block gutters which can cause flooding and the alkalinity of their droppings damages the paintwork of vehicles. 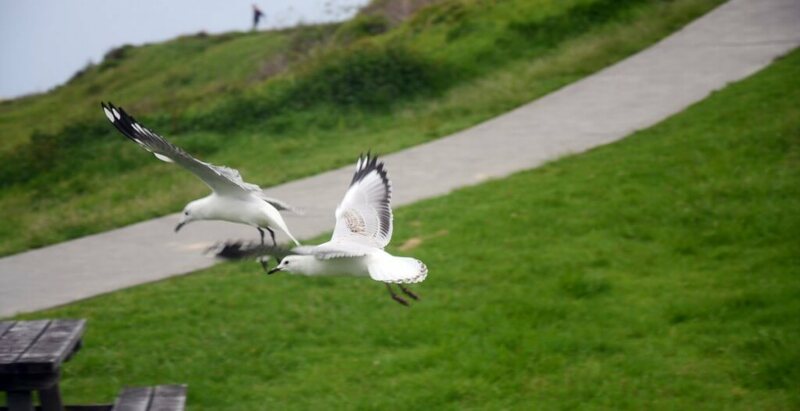 Gulls also carry many diseases which have the potential to infect humans via contact with their droppings. Diseases transmissible to humans included salmonella, E. coli, campylobacter, cryptosporidium and listeria. In Bristol the gulls have damaged both Cabot Circus and Southmead Hospital, by smashing the glass of both buildings, they drop stones in order to impress females, in recent years the birds have gotten more aggressive, dive bombing people for food, flying into buildings and into the path of cars, a theory is that the rising temperatures are increasing the populations of flying ants, the birds in turn are eating too many, the ants create a formic acid in their stomach creating a similar effect to alcohol.